I just read in our ever-informative San Francisco Chronicle that Gastón Acurio, famous Peruvian chef, will be opening his first US restaurant right here in San Francisco! According to the newspaper's Inside Scoop column, La Mar Cebichería Peruana will open in the newly renovated Pier 1 1/2 - just north of the Ferry Building (a must see for San Francisco Visitors - especially on market day). For those who aren't familiar with the name Gastón Acurio, it sounds like its time to put it in your culinary repertoire. He is famous for, among others, Cevichería La Mar, in Lima, Peru, a modern cevicheria where you will find classic ceviches and seafood dishes plus a number of modern variations like sushi and Asian-flavoured dishes. It sounds like the San Francisco location will somewhat replicate the open air feel of the original restaurant. The rear of the restaurant will open onto a marina for water taxis and other small boats. Fans of Peruvian Cuisine can travel to Peru and learn first hand the art of this culinary craze. Travelers should note that Lima, Cusco and most other parts of Peru are open for business despite the recent earthquake. Areas of the Southern Coast which were affected are doing their best to bring things back to order and those hotels that withstood the tremors (see our list here) could use the extra support during this time. While thousands of people were mourning the premature burn of Burning Man's namesake in the Nevada desert this Labour Day Weekend, we explored the California wilderness with a little camping of our own. Let me preface this by saying that although we travel frequently and have done our fair share of backpacking in the past, we are not avid 'campers'. In fact the last time we set up a tent Seth spent a good portion of the night sleeping in our Jetta. So, in an attempt to ease into our long weekend at Big Basin with friends we drove down the coast to Santa Barbara for some 'luxury camping' at El Capitan Canyon. We had visions of secluded cabins, luxury cooking facilities, outstanding views, ipod speakers, walks on the beach, etc. We were disappointed to find that for the price of an outstanding B&B we had a fairly basic cabin, located 30 feet away from another basic cabin that was overflowing with kids, that featured a run down picnic table, an empty barrel for a fire (without wood), no views and definitely no iPod dock. It took a day of wishing we'd chosen the luxury B&B up the coast before it dawned on me... El Capitan was a great idea for true campers who just wanted an extra touch. It was not a good choice for people like us who were looking for a luxurious entry to the campground. After spending two nights on a lopsided tent floor in Big Basin I realized that the small luxuries El Capitan did provide (clean bathroom, jacuzzi, comfortable bed) were a valuable proposition. Just a bit too pricey for my vacation expectations. A closer look at the website shows that they do not actually describe themselves as a luxury campground - this is a term that was used in an article we'd read way back when.. The site more accurately describes the campground as "Enjoy services and amenities typically found in a traditional resort, yet it’s minimalism without deprivation…comfort without over-indulgence. The glories of nature without the overbearing manufactured hand of man." Travelers to Peru can now take advantage of a similar luxury. Mountain Lodges of Peru has just launched its Lodge to Lodge Hike to Machu Picchu, which allows travelers to hike the Inca Trail with the luxury of finishing your day at a beautiful lodge located on private land. The six day guided trek costs US$2,500 per person (including lodging and meals) - a significant premium to the traditional Inca Trail Trek, but may be just the thing for those who want to rough it in luxury. I never realized how predominant the influence of Mexican culture was all along the North Western coast of the US, especially in its cuisine, until recently traveling by car from San Francisco to Seattle. We had been advised to be sure to try the Mexican food when in San Fran. So we checked that off the list on our first meal out in the city with Jen and Seth at Papalotes in the Latin neighbourhood of The Mission, followed by Cinco de Mayo celebrations at Dolores Park. Little did we know that all along the North Western coast of the U.S. we would find traces of the Mexican culture and that Mexican food would be the most accessible to the point that we would end up dreading seeing another plate of fajitas or a basket of tortilla chips and salsa! In the touristy town of Sonoma we ran into another Cinco de Mayo celebration and even in Florence, Oregon, retirement capital of that state, we were served Mexican egg soufflé for breakfast at our exclusive, historical b&b. Our biggest surprise was Guadalajara’s, a sizable, bustling Mexican restaurant in the sleepy town of Shady Cove, Oregon, right next to the RV park. Just outside of Mendocino we were so hungry we had to make a desperate stop at the first place we found by the road - you guessed it, organic Mexican tacos. Finally in Seattle we had fantastic Vietnamese food. Asian food has never tasted so good! We wondered if a few years or generations from now this cuisine will even be distinguished as ‘Mexican’ or if by then it will be so embedded in the locals’ tastes and customs that it will simply be absorbed into the local cuisine and be known as North Western cuisine, much like TexMex has become its own genre in the South West. It will take me a few weeks to feel like having a burrito or nachos again but I have to concur with our friend who recommended we had to try Mexican food while in San Francisco. Just take note that you might want to take advantage of other international cuisines earlier in your travels if you are headed North along the coast from there. I gotta get these shoes off.. Their killing me. Yesterday was a special day in San Francisco. 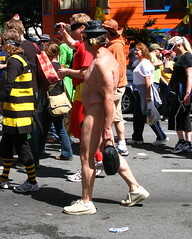 For 95 years, residents and curious visitors have come together to celebrate this annual tradition: Bay to Breakers. As the name would suggest, Bay to Breakers is a race / party that spans 12km from the Bay Bridge to the breakers at the Great Highway on the western side of town. This city-wide event began in the wake of the 1906 earthquake, as San Franciscans set upon the task of rebuilding their city and morale with a series of events. Today the event is a symbol of San Francisco’s colourful inhabitants, displaying their playfulness and creativity. Few of the 60,000 people who participate in the event are actually there to win. Most have spent days pulling together clever costumes (or in several cases, building up the nerve to go without costume and running the race au-natural). Naughty nurses, drunken sailors and even a mobile Tiki Bar are some of the cast of characters you will encounter along the way. The shopping cart is a typical race prop, used to push kegs of beer, to keep participants well hydrated. Residents who live along the course reciprocate their good fortune by adorning their front lawns with artistic displays and creative shows to keep participants entertained and encourage them to go the distance. This event is a must-see for any Bay Area visitor wishing to get a feel for the local culture. It's that time of year again... the San Francisco International Film Festival is back. In every international film festival Argentina is inevitably represented by a film about the beloved Diego Maradona - Argentina's iconic soccer player. To some he is a figure as important as Eva Peron, if not more. Last year the International Latino Film Festival featured Amando a Maradona (Loving Maradona) a film that humorously depicted the country's passion for its legendary footballer. Last night I went to see the SFIFF's presentation of The Road to San Diego, a tongue in cheek story of one fan's devotion to 'el Diego'. Known for his offbeat themes, Argentine director Carlos Sorin tells the story of a naive young man named Tati, who is such a fan that he named his first son Diego Maradona, trained his parrots to cheer 'Maradona! ', and tattooed a full sized #10 on his back (resembling a soccer jersey) in addition to a tattoo of Maradona's face on his arm. Despite having no job and little money, Tati leaves his wife and three children at their home in a small jungle town of Argentina's Misiones province after hearing about his idol's heart attack and subsequent hospitalization. On Tati's journey to Buenos Aires, he encounters fandom and well-wishers that are characteristic of the warm, welcoming inhabitants of Argentina. With him he carries his prized possession - a wooden statue he has carved to resemble the soccer hero - in hopes that he will support Maradona's health with this gift. In the end, the story gives an inside glimpse of Maradona's role as an icon in Latin America and reminds us that everything happens for a reason. If you plan to travel to Buenos Aires, be sure to check out the Bombonera, home of Maradona's Boca Juniors Football team. Many people, locals and visitors alike, pass right through San Francisco admiring the bridge, the bay and the famous skyline without even noticing some of the city's more unique aspects. Hidden in alleys and splashed on the back of buildings are some of the most vibrant works of art this city has to offer. San Francisco is home to over 600 professional murals depicting historical events, reflecting cultural pride, and advocating social and political causes. A large number of these murals are found in the Mission District, a multicultural neighborhood of primarily Latin American descent. Sadly, this is also where much of San Francisco's gang violence takes place which has led to the area's reputation as a dangerous, run-down neighborhood. However, there is a tremendous amount of pride and sense of community amongst the families who live here. In an effort to encourage this, Precita Eyes has developed the Mural Arts Center to enrich and beautify inner-city environments. In collaboration with the local communities, Precita Eyes brings art to the people, allowing them to express their feelings and concerns through this medium, while enhancing their surroundings. One of my favorite places to find these murals is Balmy Alley, on the Eastern side of the Mission District between 24th and 25th streets (see photos above). Murals began here in the 70's, depicting political struggles of Latin American people. The stories are enhanced by rich colours and outstanding artistry. There are many other nooks and crannies that will reveal similar artwork and expression throughout the city. While discovering these local gems, check out the front step of 3171 25th street where a new display (often a tribute to the Beatles) is created each month. Precita Eyes runs tours every Saturday and Sunday (rain or shine) or you can buy a map ($3) and take a self-guided tour. On this day, November 1st, teachers throughout Northamerica are suffering the wrath of cranky kids recovering from their Halloween sugar highs. San Francisco is no exception, where children and adults alike spend countless hours preparing the ultimate costume for the occasion.The Castro district is notorious for its Halloween party, where several blocks are cordoned off and stages are set up for performances in the street. Although in the Castro it's difficult to tell who is dressed up and who is simply wearing their normal attire, it is a great opportunity for people-watching. Sadly, over the years, the event has become increasingly dangerous as some take advantage of this crowded, less-than-sober forum. Outbreaks of violence are now, unfortunately, a part of the experience. This year, in an effort to curb the violence, the city imposed an 11:00pm curfew and increased the police presence by 25%. Figuring that it would be a relatively low-key event, Seth and I decided to take a stroll down to the Castro after dinner and see what it was all about. Admittedly, it was a bit strange to have to wait through a security search line-up before entering this street event (are metal detectors next? ), but it was worth the wait to see what was on the other side: some of the most elaborate and well-thought-out costumes I have ever seen. There were lots of women (and men) taking advantage of the occasion to wear that skirt that's just a little too short, but also many creative efforts including action figures, cartoon characters and famous personalities. I was more than stunned watching the 11 o'clock news last night to hear that after we'd left, 10 people were injured by gunfire and several other suffered stab wounds. So much for the extra security - our first Halloween in the Castro may have been our last. Few people know that Halloween is actually a holiday that grew out of the November 1st All Saints Day celebration. There are several version of its origin, but it seems that the Celts who, like many others, begin every day at sunset the night before, morphed the event into All Hallows Eve, which ultimately became Halloween. Throughout Latin America, All Saints Day (Dia de Los Santos) is a celebration that involves weeks of preparation. Click here to listen to our podcast about the event. The summer I lived in New York was when I first grew to love Central Park. I looked for every opportunity to escape the city bustle and wander through this urban oasis. Our own version in San Francisco, Golden Gate Park, is often overlooked as a highlight because the area offers so many great options for outdoor adventures. From surfing along the coast to hiking in Marin to cycling in the Berkeley hills -- there is never a dull moment. This weekend we had a true fall day in San Francisco and I decided to take a walk through the city, that led me through the Haight and into Golden Gate Park. My destination was the Japanese Tea Gardens, one of my favorite spots in the city. Along the way I was sidetracked by a festival in Dolores Park, a coffee shop in the Castro and the funky shops on Haight Street. Once in the park I was again distracted by the 'Pet Pride Day' contest (only in San Francisco) and a free swing dancing lesson (see video below). The Japanese Tea Garden is tucked away beside the recently re-opened DeYoung Museum. Built in 1894 as an exhibit for the World Fair, it is the oldest public Japanese tea garden in California. The garden was developed by Baron Makoto Hagiwara, who was a wealthy landscape designer. After the World Fair, the exhibit was turned into a permanent fixture and enlarged amidst the developing Golden Gate Park. The garden was maintained by the Hagiwara family until World War II when America sent over 100,000 Japanese-Americans to prison camps. The garden deteriorated without its keepers and did not recover until 1952. There is not much to do in the garden itself, which adds to its appeal, aside from wander through it paths and admire the zen-like peacefulness. There is also a teahouse where you can enjoy a traditional cup of tea and fortune cookies served by waitresses in kimonos. The gardens are open daily from 9:00am - 4:45pm (6:00pm in the summer). Admission is $4, but free on Mondays, Wednesdays and Fridays from 9:00am - 10:00am. For more photos from my tour click on the photo below.